This week's music news features links to sign-up forms, a link to a photo gallery for last week's production and upcoming concerts and events. Click here to register your interest in buying a $12 DVD of production. Sunday June 21st our band "Catch Phrase" will be performing 2 songs at 4.20pm at the Mac Tavern after the Misfitz band. (Children are only permitted with parents). SmokeFree Pasifica Beats 4pm June 27 at WE HQ, 422 Tuam St featuring our band "Automatic Growth" from Chisnallwood. Xpression Mid-Year Show 6:00pm June 27 @ Celebration Events Centre - 81 Bickerton Street, Wainoni Tickets $5 Single / $10 Family (No charge for students who are performing) featuring the Friday after school Chisnallwood Hip Hop Dance group. We are looking forward to Cameron Pearce from CPIT Music Arts Jazz School working with our jazz bands on Friday June 26th at Chisnallwood as part of the JazzQuest Mentoring scheme. 12noon – combo, 1pm Big Band. This will be combined with Halswell School players. Best wishes to those Chisnallwood students sitting a grade theory exam this Saturday 20th June. 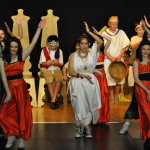 TWO SPECIAL OFFERS FOR OUR STUDENTS TO ATTEND DRESS REHEARSALS IN JULY! The film will be on the big screen accompanied by the Christchurch Symphony Orchestra. The CSO production manager, Pete McInnes will be running a limited space tour backstage so you can what goes into putting together this event. Tour is at 11.30am, and students can stay on for the rehearsal from 12-3pm. They have limited space for this tour, and we need to confirm our final numbers by the Friday 26 June. If they still have space, we will be informed, as some schools may not take up the offer. Students can attend the full rehearsal (with film and orchestra) at no cost, and this number isn’t limited although we will need to know the numbers expected by the 26 June. Please fill in this form if you are keen! The actual concert is July 4th, 7pm at Horncastle Arena. If you are keen to get a cheap “Chisnallwood schools’ offer” ticket to the Madama Butterfly Opera dress rehearsal on July 21st ($10 student, $25 adult) please fill in this form. It is sung in Italian and accompanied by the Christchurch Symphony Orchestra at the Isaac Theatre Royal.